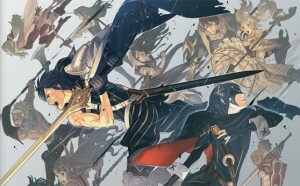 Fire Emblem: Awakening is set for release in the Uk on 19th April. It is a top down, grid-based, turn-based strategy and fantasy game developed by Intelligent Systems. Counting the two DS remakes, it is the thirteenth game in the Fire Emblem series. For convenience sake, I will be referring to the game as “FE13” in this review. 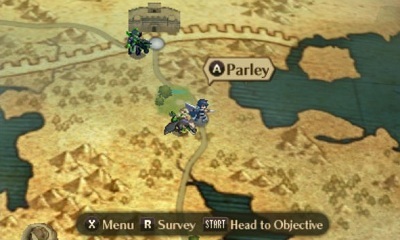 In FE13, players deploy units on a map and have them battle against the enemy units. However, unlike strategy games like Advance Wars, every ally unit is a character with their own unique personality, character class and skills. For the second time in the Fire Emblem series, you can create your own unit in the game and customize their appearance. 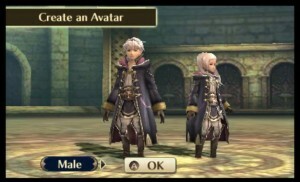 A character named Robin by default and known as “My Unit” will serve as one of the two protagonists along with Chrom, the “Lord” of the game, and will play a major role in the story. Should any of these two characters fall in battle, it is a Game Over. Making a return is the ability to move freely on the world map. As the game progresses, more options open up, and there are side chapters known as “Paralogues”, as well as enemy units appearing on different areas that you can battle for experience, or merchants that are willing to sell you items. Sometimes they may even sell you items that you cannot normally buy, or they might even sell normal items for you at a reduced price so it is beneficial for you to wander around the world map every time something new appears. Every location on the world map has a shop and each shop sells different items. 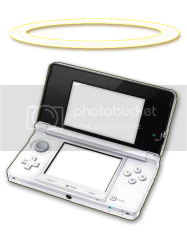 One of these items is what’s known as a “Reeking Box” which when used, summons an enemy unit to the spot where you used the item (the enemy’s strength depends on where you used the “Reeking Box”) ; this allows for you to grind characters and make them stronger for upcoming chapters, a feature which wasn’t really apparent in previous games. 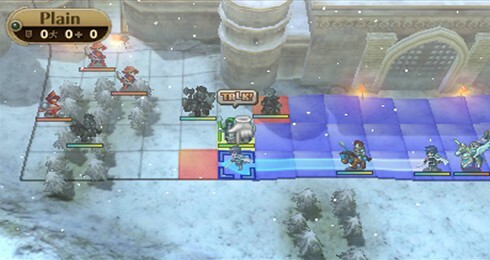 Sure, you had Arenas to grind at, but it was a risky task and a lot slower than what you can you do in FE13, this feature not only makes your current party stronger but can make your off-roster units catch up so that they may hold their own against enemies in actual chapter battles too. Of course you can’t have a Fire Emblem game without a diverse cast of characters with their unique personality and class, and all the old favorites are back; cavaliers, archers, fighters, mages, thieves… . 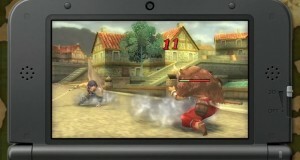 There are of course, new classes such as the War Monk (a wielder of axes and staves), the Taguel (beast men who can transform with their special stone, similar to that of the Manakete), and the Dark Knight ;horseback mages who can also wield swords… Speaking of classes, the promotion feature remains the same, characters that have reached level 10 can promote to an advanced class by using an item known as a Master Seal, and upon using this they have a choice of becoming one of two classes depending on his current class. For example, having an archer use a Master Seal will allow you to promote him to a Sniper or a Bow Knight. However, FE13 kicked it up a notch and introduced an advanced version of the “reclassing” feature from FE12, by using “Second Seals” at level 10, characters can class-change into a different class (each character has their own unique class set, so not everyone can become any class) OR they can go back to being level 1 of their current class to catch up on stats. Class-changing has MANY benefits, it allows characters to learn skills from other classes that they would not otherwise acquire, for example, class-changing a Knight into a Thief will allow the Knight to get some speed growths as well as movement-based skills before reclassing back to a Knight, thus allowing that unit to compensate for his weaknesses. Skills are also present in this game; they are (mostly) passive abilities which you can equip up to five of on a character, granting them benefits, big and small. Different skills are learned depending on the class and level ; each class offers two different skills, level 1 and 10 of a base class and level 5 and 15 of an advanced class. Of course, since reclassing is always an option (and the fact that you can buy Master Seals and Second Seals), you are never stuck with a set of skills for a character. However, you may notice that the income of experience points will start to plummet as you gain levels, especially if you reclass multiple times. There is a large variety of weapons and items throughout the game that you will acquire either by shops, dropped by fallen enemies, visiting villages and houses, or even found on the ground. Every map has at least two sparkle points which when you move a unit over, one of the following will occur: the character gains EXP points, the character finds an item, the character gets some points in their weapon rankings, or the relationship between two characters will improve (which can only happen if that unit is paired up with another unit). The pair-up feature is a new feature to the Fire Emblem series and is almost essential if you wish to keep your units in top shape. Moving a unit adjacent to another unit will allow you to do the “Pair Up” feature which is combining one unit with another and, depending on the characters’ classes, the unit that has been paired up will gain stat boosts. Also, depending on their relationship with the paired unit, different possibilities in battle will open up, such as additional attacks and even the chance to negate damage completely. Pairing up also has benefits outside of battle, while paired up, you can switch between the two units which allows for possibilities that wouldn’t exist otherwise ; for example, you can pair up a slow moving unit such as a knight with a unit with high mobility such a Pegasus knight and cover large amounts of spaces and rough terrain to give the knight a quicker access to the heat of battle that he wouldn’t normally would. This feature also allows weaker units to withstand more hits if you pair up a strong unit with them. Of course, the downside is that if you use Pair Up, you have one less unit to work with for every Pair Up you do, but it is definitely worth it since you can split up at any time and you can even transfer paired up units between units. One intriguing aspect of this game is that male and female characters can get married via the ‘Pair Up’ feature. Who says romance in video games is dead? Through the use of Pair Up in battle, character relationships will improve, boosting the chances of additional attacks and help in battle. It also, unlocks support conversations between characters which you can listen in on at any time on the world map. Supports consists of C, B, A and in the case of male and female characters, S rank, which leads to the two characters becoming married. Further on in the game, children of married characters will appear in their own “Paralogue” chapter and join your party, the children character inherit different base and cap stats as well as skills depending on who their parents are and what classes they happen to have access to, some players may see this as a great opportunity to replay the game multiple times to see what pairings yield the best results. One thing I must mention about this game is the artwork ; the unit sprites are extremely charming, the map and the terrain are also very visually impressive and the 3D is just the cherry on the top. The character artwork is beautiful and every character is recognizable as soon as you see their portrait, which isn’t something I can say about the 3D models however. They’re not bad, but they’re not spectacular either… The battle animations are decent but they’re not as charming as the 2D sprites from the GBA Fire Emblem games in my opinion. There are three different levels of zoom during battles allowing you a larger view of the battlefield and you can highlight enemy units and press the A button to see their attack range. Alternatively, you can press the X button to see the attack range of all enemy units so you can plan ahead and keep the fragile units out of harm’s way. The game has voice-acting but not full voice-acting in the sense that you will not hear everything spoken word for word. Instead, you will hear a word or a couple of words and in some rare cases, a line, while the dialogue is shown, this did not bother me that much but it would’ve been less annoying if every time you pressed the button, you didn’t hear “Hm?”, “Ah.”, “I see.” and “Gods!” ; either cut it down a little or have full voice-acting in my opinion, but that’s just me being picky. Speaking of sounds, the soundtrack is wonderful, the battle music fits perfectly with the game ; the sound of weapons striking as well as the cursor movement are all rather charming. Oh, and there is an option for Japanese voices as well in the options menu. The game’s main storyline takes around 25 to 30 hours to complete, but those will be some of the best hours of strategy gameplay you will have. Fire Emblem: Awakening is the most fun I have ever had with a Fire Emblem game, it is extremely addicting and pulls off the “one more battle” feel rather well. The game is playable to both newcomers and veterans of the series alike and will go down in history as being one of the most memorable Fire Emblem games of all time. Fire Emblem: Awakening is DEFINITELY worth £40 and is a worthy addition to your 3DS library.